I have been fortunate to have visited Hawaii on many occasions. I have decided to write about 3 textile-related experiences I encountered in Honolulu over several years. Today I wish to introduce to you the design house Tori Richard. One of the benefits of touring with textile experts is the inside look at collections we are usually afforded. At their office/archives panel after panel of the iconic fashions, designed over a period of more than fifty years,were displayed. .One could easily image their famous clientele wearing these fashions at galas, during cruises and on the most fabulous vacations. Just seeing the glorious designs in the most vibrant printed fabrics made one appreciate the impact made by this company in the field of resort and vacation-wear. 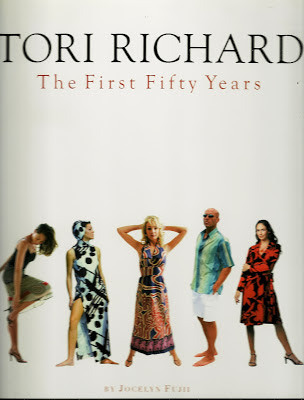 This volume was published in 2006 to commemorate the fiftieth anniversary of Tori Richard. 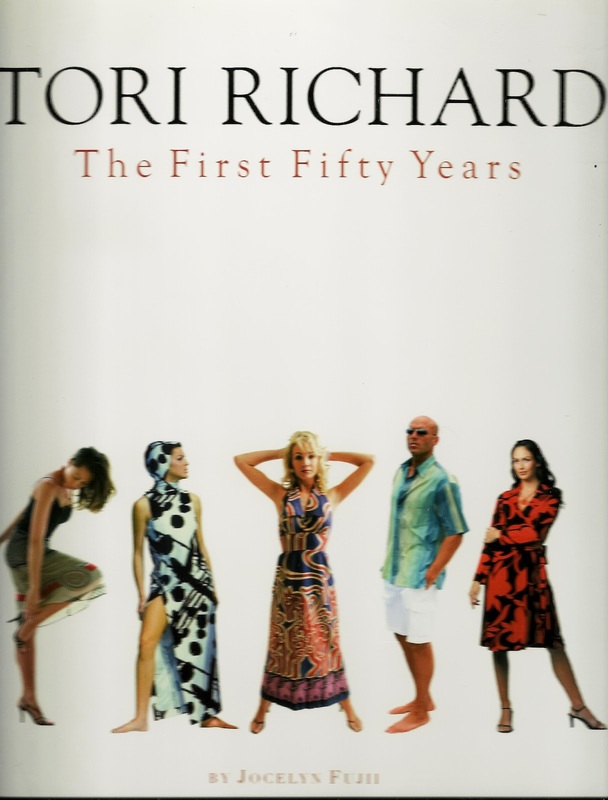 The history written here is beautifully highlighted with photographs of the Tori Richard design line which recall fashion and design from the 1950's onward, but are still immensely popular today. As is the case of many successful entrepreneurs, Mort Feldman the founder of Tori Richard was a self-made man. Originally from Boston and already established in the textile trade of Chicago, Feldman fell in love with the lifestyle of Hawaii upon visiting a friend in 1953. In 1956 he established Tori Richard with 2 partners in a room at Pier 7 at the Honolulu Harbor. The company name, Tori Richard is built upon the names of 2 of his children, Victoria and Richard. Feldman had a great love of Asian, particularly Japanese design. This, coupled with the impressive design elements of the Hawaiian Islands would be the beginning of a fashion empire that soon became global. The main factor to this success was, in my opinion, his attention to detail. Feldman chose the most highly skilled Japanese fabric printing firms too produce his fabrics. One such endeavor involved the making of Tegaki, a handprinted yardage created in lengths of up to 12 yards. This guaranteed each garment design was unique and no client would see her Tori design on another client. The designs also matched pockets and fronts for an uninterrupted pattern and French seams insured there was no raw edges ever to be seen. Collars were interlined so they laid flat and buttons were created to match the garment. In 2008 Tori Vintage reintroduced the most popular Tori designs with a modern update. 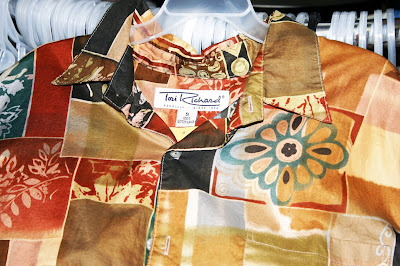 Tori Richard shops can be found in many major cities throughout the US and abroad. Many upscale stores also carry garments from this fashion house. Because of the superior manufacture and the lasting popularity of the designs, original vintage Tori Richard garments can still be found on the secondary market at a high price.. I still look for them at every “slightly used” shop I encounter.